Celebrate Black History with Biographies—with FREE Download! This is a guest blog post by Dana Lester, who writes a blog called Common to the Core, in which she writes about the Common Core State Standards, student reading skills, behavior management, books and products, and more. Dana is writing a series of guest posts; to see her other contributions, you can click here! This month I set up a display of books on famous black Americans to bring attention to Black History Month. My students have loved this display. It’s brought to light many books that were tucked away on a shelf that might not have been noticed in awhile. I also have a few biographies from the Hameray Biography Series, which are my favorite. They are not in my library circulation, because they are paperback, but they get plenty of use in the library. 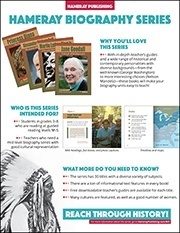 I like them because the reading level is third to fifth grade, there are many colored photos throughout, and there is an index, timeline, glossary, and list of other resources in the back of each book. The timeline is a perfect reference for projects and the “Learn More” resource list is a perfect addition because it lists other books, videos, and websites! My students like these biographies because of the color pictures and photos. I think they also like the fact that they are small and paperback. Paperback books just feel more informal and fun. The reading level these books are written on is perfect for third grade and beyond. The text is interesting and has a conversational feel to it rather than textbook language. There are fun facts throughout each book. There are thirty titles in this series and I am super excited about the Teacher’s Guide that is coming out soon! If you are in need of biographies your students will WANT to read, look no further! This series is a hit in my library! We spent a week focused on biographies. Each student chose one person and used information from all the biographies I had on that person to complete a biography research report. The students who used my Hameray books had a much easier time understanding the information and filling out their report organizer. Look below to download the report organizer my students used in creating their reports! Dana Lester received a B.S. and Master’s Degree from Middle Tennessee State University and is currently teaching at Walter Hill School in Murfreesboro, TN. Dana is also a Common Core Coach with the Tennessee State Department of Education. She has 12 years of classroom experience and has just begun her role as Library Media Specialist. As a strong advocate of the Common Core Standards and Whole Brain Teaching strategies, she engages her students in hands-on, inquiry based learning and shares many ideas and activities on her blog, Common to the Core. She was named Teacher of the Year at Walter Hill in 2013. To download the Biography Research Organizer, click the worksheet image below. To learn more about the Biography Series, you can click here to visit our website, or click the series highlights image below to download an information sheet with key features.